Our final stop after the Amalfi Coast, Tuscany, and Western Switzerland was Paris, the city of love…and foodgasms. Leaving miles and miles of walking for last day may have been a little crazy since we were totally pooped after 14 days gallivanting all over Europe, but it was worth every last second bite. Overall, Paris was surprisingly cheap. At least compared to where we had already been. They even have free water (woahhhhh crazyyyy). After two weeks of purchasing it everywhere, this was pretty exciting. Okay, back to the trip…after a lot of research, I was torn between which area to stay in. I finally chose St. Germain, which turned out to be an up-and-coming neighborhood in walking distance to pretty much everything. Our 2-CV local tour guide even said we picked quite a cool place. While in Paris, we basically just bar and appetizer-hopped our way around the city for two days and had a spectacular time doing so. Breizh Cafe. The crepes here are so so so good. Salmon and goat cheese is to die for. Eggs & Co. Matt found this place on Yelp and I would venture to say it’s pretty hipster, with the hole-in-the-wall type of look. Yet, it’s decorated tres cute and the food is great. I had the benedict and au plait eggs with bacon, chives, and parmesan plus they give you salad and yummy mini potatoes. Odette. Definitely stopped here because 1. it looked cute and 2. because it rhymes with my name. Turns out they have yummy cream puffs and I don’t even like cream puffs! Les Philosophes. Two words. Foie gras. I didn’t know what exactly I was eating until I had finished, but holy s*** it was good. Who knew duck liver + jam on toast could be so tasty? We also had the french onion soup, because well, France. Paul. I think this must be a chain since I saw two of them, but they’ve got some great pastries. Escargot. Turns out, not a fan. We ordered half a dozen, tried to thoroughly chew 2 and were unsuccessful. Also had to awkwardly ask the waiter how to get those suckers out of the shell with the clamp. Everyone in the restaurant had a good laugh. Le Marais. A cute historical neighborhood in the 3rd Arrondissement with plenty of shops and food, notably Les Philosophes. Rue de Boci. Another super cute neighborhood with outdoor cafes, live music in the street, and great people watching. 2 CV Tour. Matt’s dad said we HAD to check out this 2-hour night-time tour and he was totally right. Riding around Paris in a lavender-colored, French version of the VW bug with no roof was seriously the coolest thing ever. Our tour guide was a local French woman who was a bit crazy behind the wheel but very entertaining and knowledgeable. Not only did we get to see all of the big features in Paris lit up, but we got a great lay of the land on night one. We will definitely be back and I can’t wait to continue exploring and EATING! Let me first just say that we still can’t decide where we liked best in Italy. Amalfi vs. Tuscany? Can you really even compare them? After making our way from Positano to the Napoli train station, we cruised up to Florence where we rented a car and had a hellofa time navigating the roundabouts and making it out to the highway. While in the southern region, we stayed in Chuisi for three nights and took day trips to Montalcino, Pienza, and Montepulciano, all of which I would highly recommend visiting. On our last night, we stayed in Florence, so we stopped in Siena on the way back up north. I wish had more time there, but we overslept and had to rush back to return our car on time. Guess we just have to go back! A little PSA about the Autostrade. This is a toll road where you take a ticket on your way on to the highway and insert that ticket into the machine when you get off on an exit and then pay a fee based on the distance you went. Make sure not to go through the express lane and also follow signs for change versus card since they are two different lines. If you like history, many historical places don’t have much information about them. Thank goodness for Matt’s international plan or he wouldn’t have known what year the church of Pienza was built in! While driving on the straight roads in Chiusi, we oddly felt like we were in Lodi, CA. Brunello comes from Montalcino. Sangiovese from Montepulcino. More on that later. We spent three nights at Poggio Piglia in Chiusi, which was such a treat. First of all, the property is absolutely amazing. Grape vines and olive trees galore, a large vegetable garden, tons of lavender, sage and rosemary, and plenty of space for morning and evening walks. The service is incredible, the breakfast display was almost too pretty to dig in (but we did of course), and while it’s pretty far south, it forces you to drive all around the region which I would say is a great thing. Poggio Piglia was also the only hotel we stayed at that didn’t nickel and dime us for small extras like a poached egg in the morning, tea at night. Montepulciano is essentially the wine capital of Tuscany. Italian wineries must follow strict rules based on their region. Here, they produce wines with at least 75% Sangiovese. Wines labelled DOC have an even higher Sangiovese content and DOCG is the highest at 100%. Most importantly, we learned that because of this high quality stuff, it was literally impossibly to get a wine hangover. In the US, winemakers don’t have to follow rules like this, so it’s no wonder that after 3 glasses, you might end up with a pounding headache. Another thing to note about wine tasting in Tuscany…you might think this would be incredibly easy and you can just show up and be welcomed with wine and charcuterie platters. However, it’s quite the opposite. A lot of wineries have certain tasting hours and only take reservations. We were turned down by multiple during their open hours because they already had a few people there. Being used to America where restaurants and bars are all about packing the house, Italy was all about quality of service and never overcrowding their spaces. This is nice and all, but where can a girl get a glass of vino?! Luckily, after about an hour and a half of driving around, we ended up finding three wineries right in a row that were not only open, but also open to having us there. Needless to say, Google isn’t always right. It isn’t always open a the time it says it is, there isn’t always food. Just play it safe and call ahead. Also, most wine tasting rooms don’t have snacks and they also have you tour the cellar before you taste…without a glass of wine. Cantina Tombesi. 5 euros for a glass of nobile and 9 euros a cheese and meat platter while you sit and chat in a cute little cellar/market. Veduta Panoramica. While wondering the streets of downtown Montepulicano, we saw a sign that said Panoramica. I don’t speak Italian very well, but I definitely know what that means. Picture time! Talosa Tasting Room. Great wine and a huge cellar that seems to never end, complete with an old tomb. Avignonesi. I would say we have pretty high standards for cheese and charcuterie platters. Avignonesi’s light lunch chef’s platter blew every pleasant thought about any other board out of the water. I’m talking about mmmm’s and oh my god’s in between each bite. We topped that off with their delicious Avanti Sangiovese/Merlot plus a wasp sting on the side. Sorry Matt! Poliziano. Wine so good, we just had to ship ourselves some. Still hoping we weren’t just drunk and thought it was better than it really was. La Grotta. My coworker recommended this restaurant as the best meal he had in Italy. We were running a bit low on energy by the time we had dinner here so we took most of our meal to go but it was quite good. Vino Mobile. Next door to La Grotta, this cute little shop is run by the sweetest woman ever. Turns out her husband is from Brea, CA so we sure had a lot to talk about! Takeaways include cured meats, pasta seasoning mixes, spicy chocolate, and a bunch of other delicious items. Bagno de Vignini. Okay, this was so cool. Bagno de Vignini is one of the many Tuscan hot springs and happened to be located on our way to Montalicino. Matt was very skeptical about the coolness of said hot spring, but I was determined to find it. It didn’t help that Google Maps had us take a very sketchy back road to get there (second dirt road after you turn off the main highway) and we weren’t sure if our tiny smart car would make it back up the way we came. Turns out there’s a paid parking lot above, where you can overlook the hot spring, but we thought it was pretty awesome to be able to cruise around below, even though portions of the walkway were flooded. Pienza. Pienza is a small town with an incredible long walkway overlooking the hills of Tuscany below. It’s definitely worth a stop for some gelato or a quick snack! La Fortezza in Montalcino. This old fortress charges 2 euros to take in some breathtaking views. It’s quite the maze inside, with various rooms connected by tunnels…so cool!! There’s also a wine tasting room inside. Cafe Corsini in Montalcino. Located somewhere in a small park with some weird dolls in Montalcino, this cafe was cheap, had GREAT food and there were a lot of locals eating there. Yes, the dolls sound weird and they were, but the outdoor cafe is really quite lovely. I got the tartufina (panini with prosciutto, truffle cream, and argula) and braesaola salad (thinly sliced raw beef, salad, pine nuts, tomatoes, and balsamic cream sauce) and was in heaven. Are you drooling yet? Oh and the brunello. Don’t forget the brunello. We arrived in Florence at about 2:30 pm on a Friday and had to take the 9:00 am train to Milan so we didn’t get much time there. In our short time there, we walked all over the north side of the river. It’s truly an amazing city full of breathtaking architecture. I already can’t wait to go back and see more of it. Sesto Rooftop Bar at Westin Excelsior. I know, I know…the Westin is not a legit Florence bar, but hey, we’re all about rooftop drinks. With views of the river, duomo and city, we couldn’t ask for more. Ask for the cookies with your drinks. Yum! Uffizi. A couple we met in Positano said we had to go here and luckily, we were able to buy tickets at the door and cruise around. Although we didn’t realize the entire museum showcases heads and statues made of marble, it was amazing! But let’s be honest…there’s really only so much time you can spend looking at various people from the shoulders up before you start going dizzy. Palazzo Gamba. I didn’t realize this when I booked, but this apartment looks directly at the Duomo. There’s nothing in between you and the Duomo except the street below. Needless to say, we thought this place was pretty rad. Since it’s located right in the middle of Florence, it’s a bit loud, but totally worth it for being central. Did I mention you can stare at all the intricate details of the Duomo from your bedroom and living room windows?! P.S. You can read my Amalfi Coast recs for Positano, Sorrento, and Capri here. Thanks to a Trader Joe’s taster, I’ve discovered a super easy, filling and delicious salad that I have to share with everyone who didn’t get a sample from the Aliso Viejo location that day…so probably everyone. Matt has a no-salad-for-dinner rule because he’s always hungry 30 minutes later so any time I can pack enough protein and carbs in one, I’m all for it…especially when it takes 15 minutes to make. Cook the potatoes and season with a pinch of salt and pepper by steaming and throwing on the skillet with some olive oil. In a skillet, cook the shaved beef. This basically involves tossing it around in some olive oil until it’s cooked to how you like it (i.e. medium rare). Mix 1 part horse radish to 2 parts ranch dressing. Toss everything in a bowl and voila! If you try it out, I’d love to know what you think! When my friend Kala asked me if I wanted to do a juice cleanse with her, I was skeptical and nervous. I am the queen of snacking and essentially eating all day long. 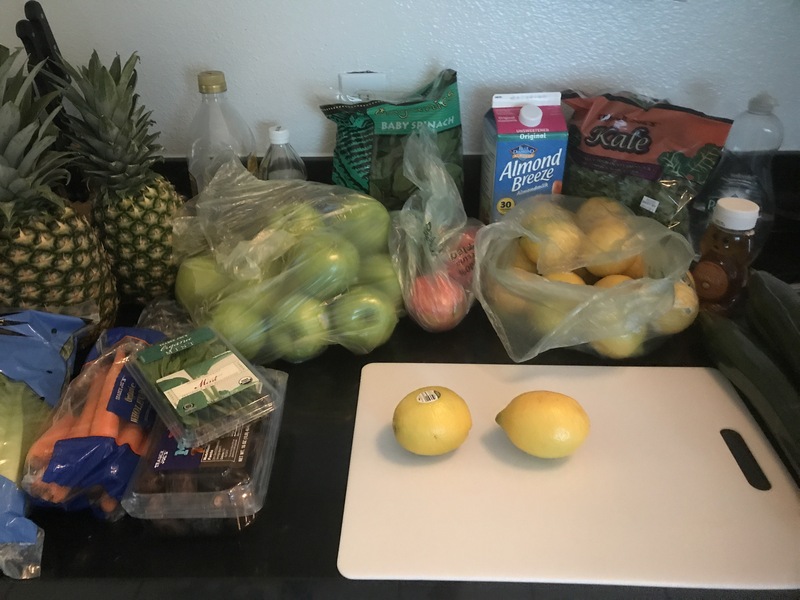 But I’ve always been curious about these multi-day cleanses, so I decided to give it a shot in order to give my body a hard reset before jumping into the final 3.5 months of wedding body-ready health & wellness. However, instead of spending $129 at Pressed Juicery on a 3-day cleanse*, I told her I would figure out how to DIY it ourselves. 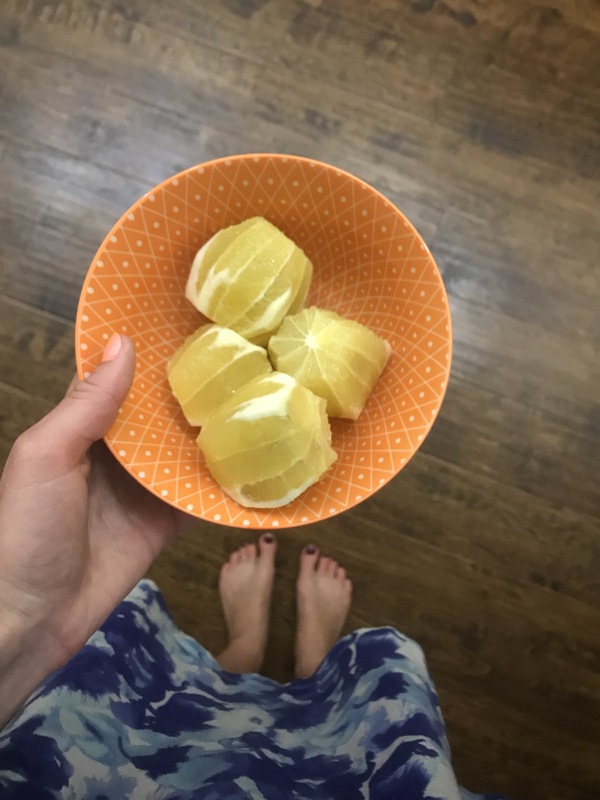 Using the Pressed Juicery ingredients as inspiration, I structured the cleanse like a couple others I had read about online…greens, citrus, greens, spicy lemonade, CAR, and almond. Overall, prepping for the cleanse took 1 hour and 50 minutes start to finish. Two hours if you count showering off all the veggie leftovers on me. It was extremely messy. Especially on juice 5 & 6 when I started getting lazy and letting some of the juice pour out of the bottle and into the sink…and floor. Whoops. I spent $58.13 on the ingredients at Trader Joes, realizing later that Ralphs would have been much cheaper. Duly noted. *Kala later told me that Pressed Juicery sometimes has specials on their 3-day cleanses for $69. In that case, I would recommend going with that if it’s available and skipping the whole juicing out of your kitchen “messy” method. 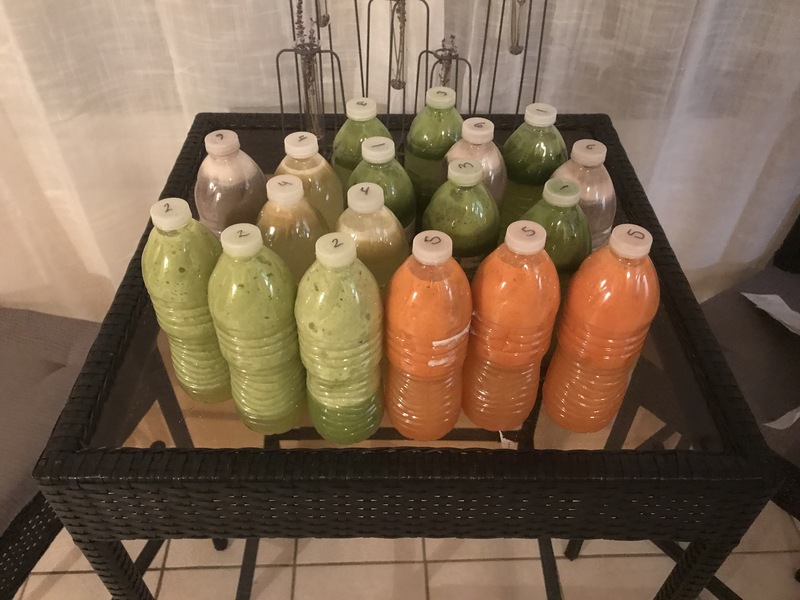 I wasn’t feeling in tip top shape after a fairly aggressive weekend, so I ended up only doing the cleanse for one day, and freezing the rest of the bottles. This turned out to be a good thing because I don’t think I could ever not eat solid food for 3 days straight. On my one day cleanse, I have never peed so much in my life. Crazily enough, I was down 3.5 lbs by 5 pm. How ’bout that water weight? Since then, I swear my stomach shrank so I’ve eating more proportional amounts and much healthier overall. One day was pretty easy and did the trick. I’ll take it! When juicing, make the CAR juice last so the carrots don’t take over any of your other juices. Also, dates have pits – at least the ones I got. Take them out before blending. Again…whoops! Make each juice and divide into 3 bottles + fill to top with filtered water. You will definitely need a juicer to make this happen. If you want to do a one day cleanse, just cut the recipes below by 1/3. Overall, I think the cleanse was a great way to purge the toxins and start me on a solid health spree. I plan to split the last two days of the cleanse later this summer when I’m feeling I need it. If you can stomach to do three days, more power to ya!